This week we will be checking out yet another awesome ceratopsian dinosaur. Enter Pentaceratops sternbergii! Pentaceratops was a plant-eating dinosaur that measured about twenty feet long from beak to tail. As a ceratopsian (horns, beaks, and frills) it was member of the chasmosaurine group, and was closely related to Chasmosaurus and Coahuilaceratops to name a few. It lived in what is now New Mexico, USA, during the late Cretaceous Period, between 76 and 73 million years ago. The genus name, Pentaceratops, translates to "Five Horned Face" in reference to the single horn on the snout, two over the eye sockets, and two on the jugals (cheek bone). I personally feel the name is a bit misleading since many ceratopsians, including ones that are named for having specifically fewer horns, have "horns" on their jugals also. When I hear "Five Horned Face" I expect two extra horns growing out over the eyes or something...oh well. Pentaceratops life reconstruction by Christopher DiPiazza. Pentaceratops had one of the largest skulls of any land animal. From beak to the end of its frill, its skull measured almost eight feet long. Most of this was frill, which was basically a light frame of bone around two large holes, called fenestre. Large fenestre are common in most ceratopsians (Triceratops being an exception) to make sure the large frills weren't too heavy. Pentaceratops' frill was lined with small horn-like structures called epoccipitals. At the top of the frill, there is a "U" shaped dip in the middle, and the middle-most two epoccipitals actually face downwards, instead of out, like the rest. 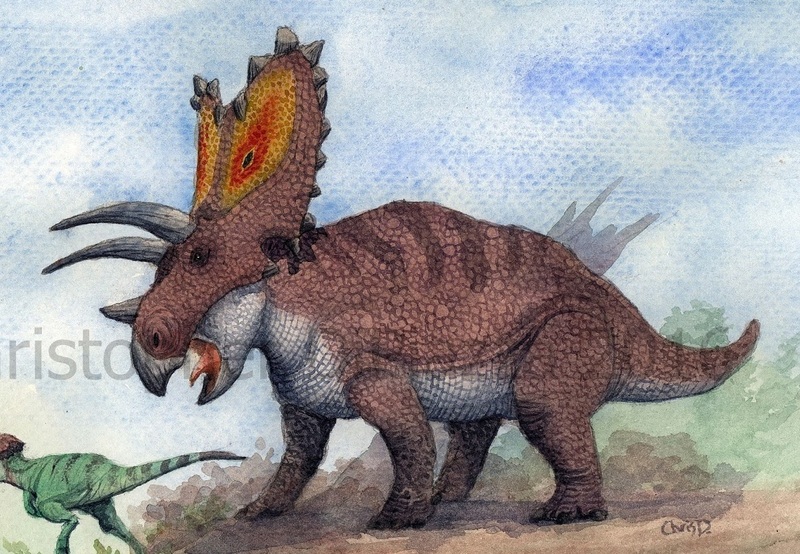 As is the case with all of its relatives, the frill and horns of Pentaceratops may have served as display adaptations for within the species, possibly attracting mates and/or intimidating rivals. They also could have aided in deterring potential predators, like the tyrannosaurid, Bistahieversor, which it coexisted with in life. Pentaceratops skull currently on display at the American Museum of Natural History in New York. 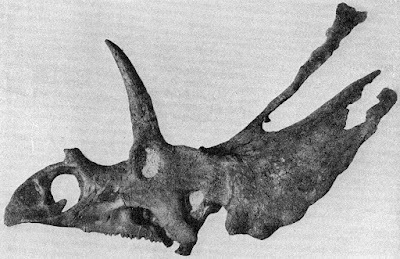 Unlike many ceratopsians, of which paleontologists more often than not only find the skulls of, most of Pentaceratops' body is known, as well. What is interesting is that the neural arches in the middle of the back are relatively tall. This suggests that there may have been muscles attaching there that led to the back of the skull, to help hold up the giant frill. Most recently, in 2011, the remains of a juvenile Pentaceratops were discovered in New Mexico by a team of paleontologists from the New Mexico Museum of Natural History and Science. It took years to finally get the big baby out of the rock until it was finally airlifted, via helicopter, to the museum in 2015 to be worked on further in a lab. This awesome find will be on display in the years to come when it is fully excavated and prepped! "National Guard Airlifts Baby Pentaceratops Fossil out of New Mexico Badlands." UPI. N.p., n.d. Web.